In his book, Searching for Memory, Daniel Schacter puts forward a curious description of memory. 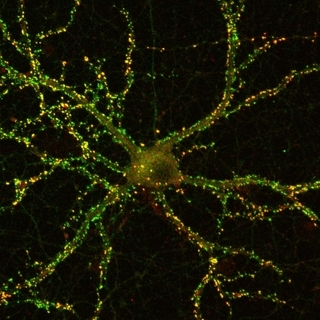 According to Schacter, memories are encoded in the brain as engrams - essentially a neuron firing pattern - that captures certain elements from the experience. Certain kinds of encoding are more likely to promote higher recall - specifically, elaborative encoding that allow you to integrate new information with what you already know. This explains why succesful ads use referent systems - as Adliterate has pointed out - by making our brain process information and linking it to things already in our heads, there is a much better chance that we will remember it. 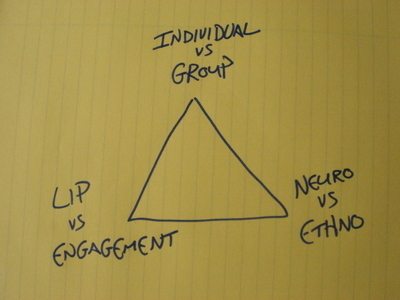 So brand experiences will build brandgrams in our heads. So far so good, this all feels pretty logical. But then he veers off. What he suggests is that the act of remembering isn't really a recollection - it is a new experience. "The cue combines with the engram to yield..an experience that differs from either of its constituents." So the cue, the piece of communication, combines with the brandgram to create a new experience that "differs from either of its constituents". People are not simply experiencing the communication but the gestalt of the communication and their pre-existing brandgram. Now that's what I call consumer created content. Coke Zero launches in the UK in a couple of days. In Australia it overtook Pepsi Max in market share in 4 weeks - despite the 5 years headstart. Pepsi have clearly learnt from this and decided to launch a preemptive strike to attempt to mitigate the effect of the launch in this market. So far so good - gain some ground while you've still got the clear playing field. They're running posters on the London Underground. Again, I'm with you on that - the tube in summer is horrible - too hot to breathe - and a great place to remind people about refreshment. Point of need and all that. 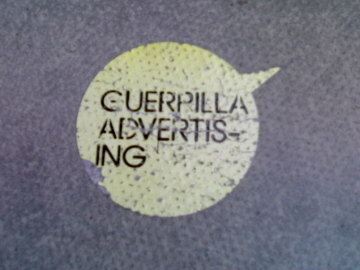 And then we come to the ad itself: well tasty. UPDATE: I've been informed that they have been sampling Pepsi Max as well. That's more like it: show them don't tell them. 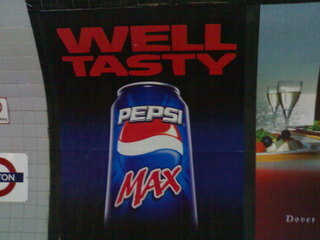 UPDATE 2: Pepsi Max were sampling all over Brick Lane this weekend - targeting those opinion former types I imagine - with promotional material proclaiming that there was NO SUBSTITUTE. Guess we'll see. In The Tipping Point, Gladwell highlights a piece of research that students were told was for a company making headphones. The recruits were given headsets and asked to perform specific motions while listening to music and a piece of editorial concerning a rise in tuition fees . A third were told to nod, a third to shake their heads, and a third to remain still as a control group. Afterwards they were asked some questions in an attempt to gauge how persuasive the editorial had been on them. The control group were unmoved by the editorial. Those who shook their heads from side to side while listening, ostensibly to test headphones, strongly disagreed with the proposed increase. Those who were told to nod up and down found the editorial very persuasive. They wanted tuition fees to rise. The simple act of moving their heads while listening was sufficient to cause them to agree with a policy that would take money out of their own pockets. 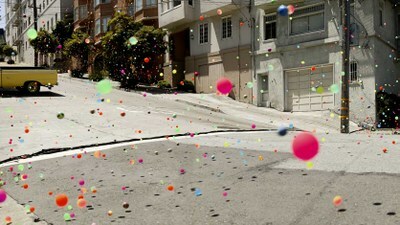 If one bouncing ball is persuasive, how persuasive are 250,000? Persuasive enough to make Bravia the world's best selling flat screen TV, push Sony back into profit and give it back its bounce. Whilst I may agree with Huntington that the ad lacks a referent system that would give it greater depth of meaning, the execution itself is based on a compelling insight into persuasion. More strategic philanthropy turned sponsorship. Spotted this last night at the newly refurbished Roundhouse in Camden. The Roundhouse is a registered charity and its renovation has been enabled by support from a large number of government bodies and large corporate sponsors. 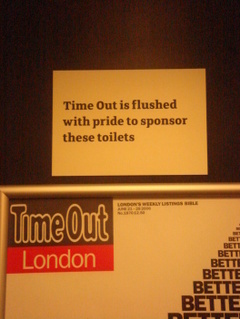 But by sponsoring the toilets Time Out ensured they are by far the most visible - since there is a bar there I imagine every visitor would see this - and they communicate their association to their core audience: people who atttend events in London. Ps. Go and see Fuerzabruta at the Roundhouse - it's incredible. 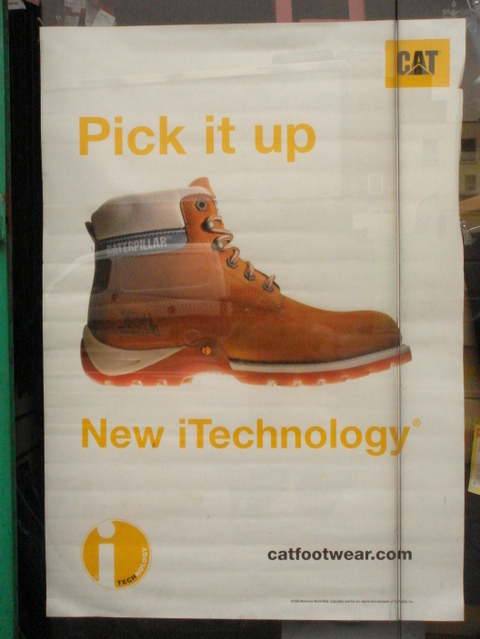 iTechnology provides the shock absorption typically only found in athletic shoes and the durability and styling true to cat footwear, making it just like the Apple of shoes. OK I added in the last bit. Can we please champion another letter now? Lower case i has been getting all the love. I vote for subscript Q.
I have an article in the current issue of Contagious Magazine about the remix, tracking its evolution from John Locke's combinatorial imagination through trailer trashing videos I've posted about before all the way to web mash-ups. 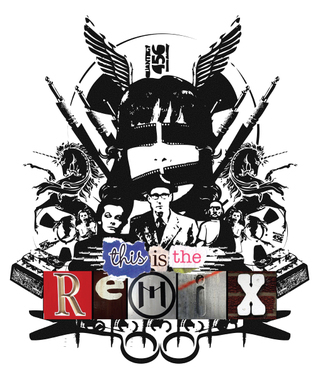 and as all media becomes digital, the remix will become its dominant construct. An understanding of this is crucial for anyone interested in how people consume media: no longer passive but recombinant and collaborative. I've posted a pdf of the whole article here. Ps. Thanks to Nick Sommer - Design Ninja for the illustration. At Changi Aiport in Singapore - A shopping festival sponsored by Visa. In some ways I quite like this. At least it's honest. Freakonomics led me to the economist John Kenneth Galbraith. We associate truth with convenience...with what most closely accords with self-interest or personal well-being or promises best to avoid awkward effort or unwelcome dislocation of life. We also find highly acceptable what contributes most to self-esteem. Economic and social behavior are complex, and to comprehend their character is mentally tiring. Therefore we adhere, as though to a raft, to those ideas which represent our understanding. 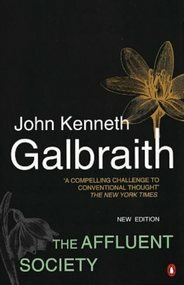 With that caveat in place, I'd like to suggest that Galbraith's definition of conventional wisdom could also be applied to succesful brands, which makes sense as he is talking about ideas that have lodged themselves into the popular consciousness - something that brands are also trying to achieve. So perhaps brands should seek to inherit a similar territory: provide convenient truths that offer well-being, contribute to self esteem and provide cognitive short cuts to complex concepts. Then perhaps people will adhere to these rafts of ideas because they represent our understanding.